Qatar in the crosshairs — but where will it end? 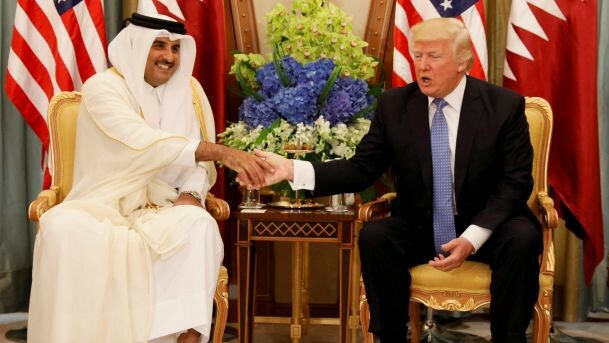 Qatar’s emir is now an outcast in the Gulf, yet little more than two weeks ago Donald Trump declared him a friend and was hoping to sell him “lots of beautiful military equipment”. The extraordinary propaganda offensive against Qatar which has been raging in sections of the Arab media for the last couple of weeks shifted from words to deeds yesterday when Saudi Arabia, the UAE, Bahrain and Egypt in effect placed Qatar under siege. 1. That Qatar will capitulate and bring its foreign policy far more into line with Saudi and Emirati policies — especially in relation to Iran and terrorism. 2. That Qatar will offer enough concessions for a compromise solution to be found. 3. That Qatar will leave the six-member Gulf Cooperation Council — making “Qaxit” the Gulf version of Brexit. 4. That the Gulf Cooperation Council will eventually disintegrate. Before considering those scenarios, let’s look at the actions announced yesterday against Qatar. Diplomatic and consular relations with Qatar are suspended. Qatar’s only land border (with Saudi Arabia) is to be closed. Saudi Arabia and Egypt (and possibly others) are closing their airspace to Qatari civil aviation. Qataris in Bahrain, Saudi Arabia and the UAE must leave within two weeks. All travel to Qatar by Saudis, Emiratis and Bahrainis is prohibited. Qatar, which had contributed about 1,000 troops to the war in Yemen, is expelled from the Saudi-led coalition. Adding numbers — if not weight — to these measures, further declarations of support are said to have come from the failed state of Libya, from one of Yemen’s two rival governments, and the tiny Maldives islands (fast disappearing under the Indian Ocean as a result of global warming). “Judging from local newspapers the series of demands appears similar to the 2014 list — namely an end to Qatari ‘interference’ in domestic politics — but this time the escalation has been so severe that is it unlikely to be resolved as easily. “Ultimately the three Gulf States do not feel that Qatar has lived up to its side of the agreement: that rather than ceasing the critical media coverage and the support of Islamist groups it has found other means to do so. It is likely that this time the Gulf States will demand the complete shuttering of the Al Jazeera TV Network before any mediation can take place. Additionally, the plug will have to be pulled on networks funded by Qatar such as Al Araby Al Jadeed (The New Arab), originally set up to compete with Al Jazeera and headed by former Arab Israeli politician Azmi Bishara. “Other Qatar backed networks that were accused of incitement on official Gulf TV channels include Al Quds Al Arabi (Arab Jerusalem) newspaper which was founded in London in 1989, online Arabic news portal Arabi 21, the London based website Middle East Eye, the Arabic version of Huffington Post which is headed by former Al Jazeera boss Waddah Khanfar and Al Khaleej Al Jadeed (the New Gulf). It is difficult to envisage Qatar voluntarily acceding to these demands in full, since that would amount to a very public humiliation. It’s very unlikely that the current emir would agree to them, though there have been hints (which some interpret as veiled threats) that he might be overthrown. Last week, the head of a pro-Saudi lobbying group in the US suggested the emir could suffer the same fate as Egypt’s ousted president, Mohamed Morsi. Emirati and Egyptian newspapers have also been talking-up opposition to the emir from within Qatar’s royal family. The immediate question, though, is whether the measures announced by other Arab states are likely to force a shift in Qatar’s position. Qatar depends almost entirely on imported food and yesterday there were reports of panic-buying in the shops. About one-third of its $1bn-a-year food imports come via Saudi Arabia and the UAE, so cutting off those supplies would harm Saudi and Emirati businesses. For Qatar, though, finding alternative sources would not be an insuperable problem. Iran has already offered to step into the breach and this could drive Qatar and Iran closer together — with the opposite effect to what was intended. “As food trucks reportedly lined up at the closed Saudi border with Qatar, Iran’s Fars news agency quoted Reza Nourani, chairman of the union of exporters of agricultural products, as saying that Iran could supply the Gulf state with what it needs. Mr Nourani said it would take 12 hours for shipments from Iran to reach Qatar by sea. “Working in Qatar’s favour is the fact that the Gulf state’s main source of revenue, its oil and gas exports, remain untouched by the economic sanctions. Qatar, the world’s largest LNG supplier, maintains access to international shipping route even if Qatar-bound vessels and ships leaving the Gulf state are barred from entering the territorial waters of Saudi Arabia, the UAE and Bahrain. “Japan’s JERA Co, the world’s biggest buyer of liquefied natural gas, said in a statement that Qatargas had informed it that the crisis in the Gulf would not impact LNG supplies. A potentially much more serious problem is the restrictions on aviation. Although Qatar Airways will be severely affected, the Centre for Aviation (CAPA) warns on its website that there will be “no long term winners from this”. CAPA suggests the restrictions cannot be sustained for long because although Qatar Airways — which operates more flights than all the Gulf’s other airlines combined — will be hardest hit, there will be adverse effects on Gulf aviation more generally. One big effect on Qatar Airways will be the loss of connecting traffic from Saudi Arabia and the UAE which forms a large part of its market. Closure of Saudi airspace means Qatari flights heading north and west will have to be diverted over Iran, adding considerably to mileage, expense and journey time. The extra distance will make some flights impossible without a refuelling stop. CAPA’s report also goes into detail about the legalities of closing airspace to Qatari flights. It appears that while the Saudis can legally close their airspace, the UAE, Bahrain and Egypt cannot — since (unlike Saudi Arabia) they are parties to the 1945 international Transit Agreement. However, CAPA also points out that even if those countries are in breach of the agreement there is no effective international mechanism for enforcing compliance. Scope for a compromise deal? Although the measures announced yesterday are likely to prove costly for Qatar, they are unlikely to bring it swiftly to its knees. Qatar is certainly not short of money, and there will be costs on the other side too. Meanwhile there are hopes that Kuwait and/or Oman — two GCC countries sitting judiciously on the sidelines in the current feud — may help to broker a compromise. “Qatar has … placed itself under the security umbrella of the United States. But instead of aligning the minutia of its foreign policy interests and objectives with those of the United States, it has sought to maintain open lines of communication with as many actors as possible, not all of whom always get along together. This foreign policy approach keeps potential adversaries to a minimum and enables Qatar to capitalise on its strategic positioning as a critical conduit for information and communication between actors that would otherwise be unable to communicate. It’s also worth noting that in additions to its Islamist connections, Qatar has also cultivated ties with religious conservatives in the west, notably Mormons and Roman Catholics. The Saudis and Emiratis also appear to be seeking closure (or at least a drastic reining-in) of al-Jazeera and other Qatari-funded media. This, incidentally, would leave al-Arabiya (Saudi-owned) and Sky News Arabia (part Emirati-owned) as the dominant regional broadcasters. But for Qatar, al-Jazeera is far more than a TV station. It is a way of projecting soft power, and a key instrument of foreign policy. Much as Saudis, Emiratis and others may fulminate against al-Jazeera (and peripheral Qatar-funded media), they are not in the same category as Breitbart in the US or the Russian propaganda channel, RT. Obviously they have a political slant but in most respects they are normal news organisations. On Qatar’s side, then, the scope for compromise seems fairly small and would probably not be enough to satisfy the Saudis and Emiratis who also fear that Qatar would try to renege on any agreement. The danger for the Saudis and Emiratis is that their current strategy, far from drawing Qatar into the fold, could send it in the opposite direction. The GGC Six could easily become the GCC Five. But it might get worse than that. Oman has long been a lukewarm GCC member, often excusing itself from Saudi initiatives promoted in the GCC’s name. Kuwait sits quietly and patiently, ready to mediate in disputes — though that role has become more difficult recently with the arrival on the scene of Prince Mohammed Bin Salman, the Saudi king’s impetuous son. If the situation continues, Oman and Kuwait may soon be weighing up the benefits and costs of GCC membership. Meanwhile, just below the surface, all is not well between Saudi Arabia and the UAE, the two leaders of the feud with Qatar. In the disastrous Yemen war they seem to be increasingly working at cross-purposes. What Does the UAE Want?